Except Russia, all the baltic sea countries are since 2004 member States of the European Union. The EU-member States were invited to implement before 2006 the european recommendation on ICZM (2002/413/EC). An evaluation of the state of ICZM in Europe (Rupprecht report- 2006) permits to have an overview of the national strategies. For each baltic country, you will find information about ICZM policies on the national level. State of implementation of the European Recommendation on ICZM. Baltic Sea Countries. 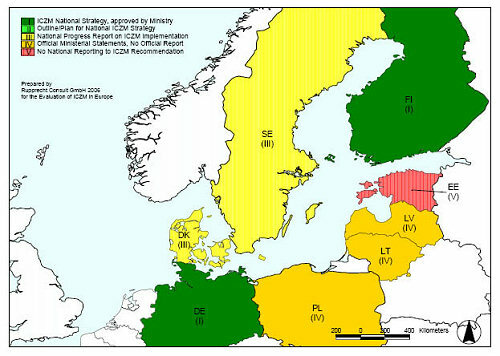 Source: Evaluation of Integrated Coastal Zone Management (ICZM) in Europe. Final Report. [18/08/2006] 01/12/2006, 360 p., p. 73.